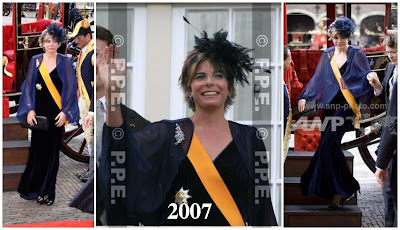 As promised, today's flashback is more Prinsjesdag fun. But first, I've gotten several questions about the dress code, so I thought I'd address those first (there are some answers in the comments on the Prinsjesdag post too). 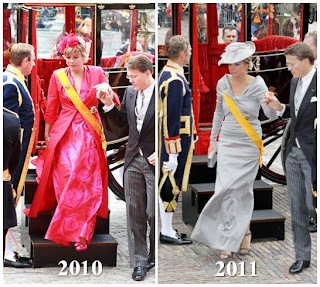 The Prinsjesdag dress code is as follows: military uniforms or morning coats for the men, with long day dresses plus orders and hats for the ladies. Tiaras aren't worn because this is a day event, and tiaras are reserved for evening events (usually). It might seem strange because we're used to seeing ladies with long dresses and tiaras these days, but it's actually not strange - it was a very common dress code up until a few decades ago. 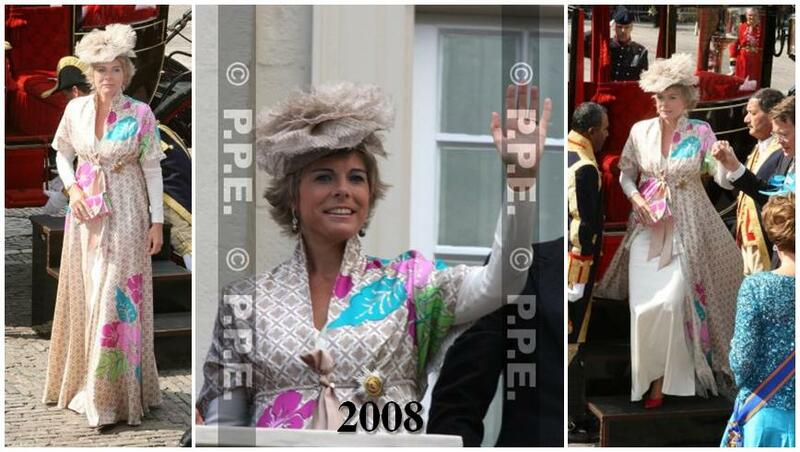 Look back to the major royal events of years gone by, and this is precisely what royal ladies will be wearing. 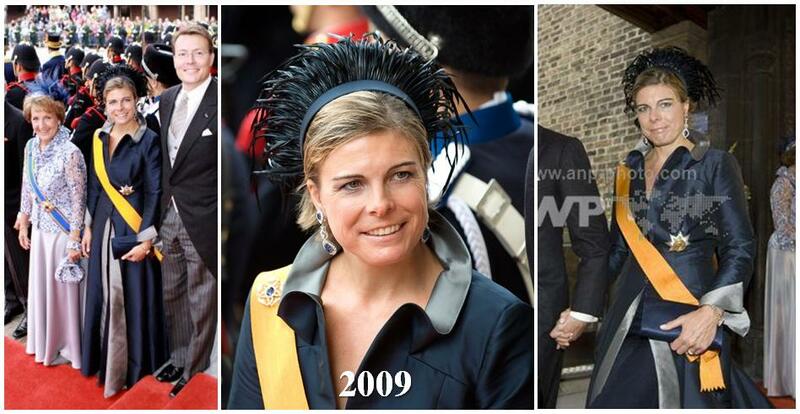 Favor switched to shorter, more casual outfits for the women over time, but Prinsjesdag never changed. And though the jewel fiend in me wouldn't mind them going full out like their British counterparts and throwing on tiaras, this is a nice throwback. A-HA! This is what I'm talking about. Four years in, and she lets her true sartorial flag fly. This is like some sort of evil mermaid Queen costume, and it is awesome. The prints may be gone, but the nuttiness lives on! I have no problem with corsets, really. This, however, looks like one of those belts that you wear for safety while lifting, custom-dyed for outfit cohesion. And though I'm sure Prinsjesdag presents its own challenges in the form of keeping one's eyes open through an entire governmental speech, I really don't think it involves any heavy lifting. On the one hand, this is lovely; on the other, it's half lingerie. So, there's that. Hee! Here we have some another nightie, but this time from Pioneer days...in Hawaii. And thermal underwear underneath! And a stack of tissue paper crepes on top! This is why I count on Laurentien to bring the giggles. You can't expect a person to dress one way all the time, I know that. Laurentien has plenty of sane moments (there's her gold star, of course, plus these recent appearances sent in by reader Heleen). But you come to expect certain things; and from Laurentien on Prinjesdag I expect some interest. Even if it is just a crazy bright color. So it's not so much that her 2011 outfit is bad...it's just a bit of an entertainment let down. Ya know? Which is your favorite year?